This particular troll model was orignally produced by the now defunct German company, Metal Magic. I bought mine from Mega Miniatures, but they have since stopped production and sold the mold to Splintered Light Miniatures. 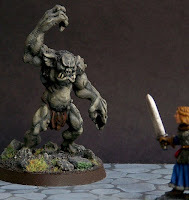 My model is mounted on a 60mm plastic base. The fungi sculpted on the troll's club is a nice touch, don't you think? 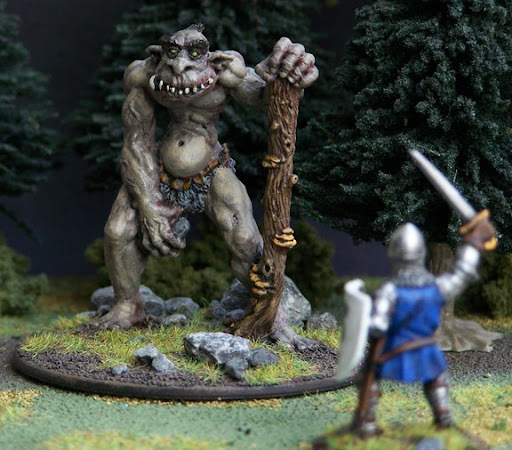 The idea of trolls seems to have originated in the Scandinavian countries. Old Norse folk tales are full of encounters with the giant beasts. The classic method of defeating a troll was for the protagonist to outsmart it. In these stories trolls frequently had multiple heads: 2, 3 even 7! This variety is represented in the Ultima series by the two-headed "ettin." I enjoy reading traditional Scandinavian folk tales to my daughter. Our favorite book was, The Troll With No Heart in His Body, by Lise Lunge-Larsen. I demand that you go to your library and check it out! Love the blog. Your painting is great and your terrain-building is excellent. I love how you picked a game world and decided to bring it to life. I remember loving the Ultima games as a kid. They were some of the first computer games to really grab me. Thanks! I had been considering doing this for a while, but I'm not sure how many people remember or care about Ultima. I'm glad you like it! Have you played U5 Lazarus? I came in on the series with U7, so I never played 5. I don't think I could go back to the cruddy DOS graphics now, so the 3-D version is welcome. I still haven't finished it. Unfortunately, I have very little time for video games as much as I might like them. I haven't played an Ultima game since 3 but I still have fond memories. I am sure you will find that among gamers and bloggers there are plenty of folks long enough in the tooth to recall those great old games. They really were ground breaking for their time. Heck, as I'm typing this, I am humming the travelling music from one of the old DOS games.